A single phase to three phase converter is a three phase star connected squirrel cage induction motor. 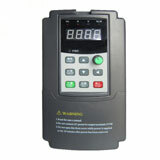 It converts 380V single phase 50Hz (across UV input) to 380V three phase (UVW) with a slight unbalance (5%) in Voltage. It is used extensively on Indian railways 25kV 50Hz electric locomotives for driving 150kVA three phase motor load of auxiliary drives like compressors, blowers, pumps...........more than a dozen. Imagine a three phase motor running from three phase input; then one line gets disconnected. What happens may surprise many; the motor continues to run and deliver the load (but reduced torque) with slight drop in speed. The Voltage across the three phases remains (almost) unchanged and an unbalance of 5% may be expected. If balanced three phase output is required; Static inverter route is fine (as practiced in modern 25kV electric locomotives). I am afraid Scott Connected transformer would not convert single phase to three phase. It is used in 25kV 50Hz single phase electric traction system to balance the three phase supply currents from the grid source. It is balanced only when two single phase (90 degrees phase apart) loads are equal in amplitude and phase angle. The basic solutions are precisely balanced three phase from a static converter or 5% Voltage unbalance three phase from a rotary (Arno) squirrel cage induction motor converter. The best way to cover all of the possible usage scenarios without introducing unfamiliar concepts to you would be to use a VFD with a good output filter. 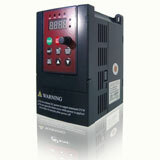 Variable frequency drives can be purchased with a single phase input and a three phase output. Just set it up for single speed at your usage frequency (60 Hz for North America and 50 Hz for most of the rest of the world) and let it do the rest. The output is balanced and nearly sinusoidal (the filter will take out the high frequency carrier); and no additional equipment is required. Buy the most simple (read cheap) VFD you can find. Extra features will just make it more difficult to program, and are only of benefit if you are powering a motor and want to change speeds or start heavy loads.